Tekken Tag Tournament (commonly abbreviated as Tekken Tag and TTT) is the fourth main installment in Namco's popular Tekken fighting game series. It, however, is not canonical to the Tekken storyline. The game was originally available as an update kit for Tekken 3. 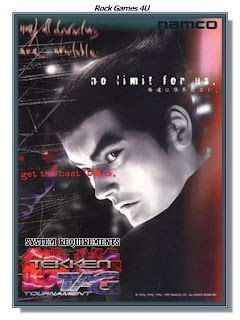 Tekken Tag Tournament was originally released as an arcade game in 1999 before it was ported to the PlayStation 2 in 2000. The arcade version operated similarly, but ran on a 32 bit graphics engine like Tekken 3. It received upgraded graphics when it was ported to the PlayStation 2. It, along with Tekken 4 and Soulcalibur II, was re-released in 2008 as a part of Namco Classic Fighter Collection. Its sequel Tekken Tag Tournament was released in 2012.A remastered version of the game titled Tekken Tag Tournament HD was released for PlayStation 3 in November 2011, as part of a Tekken Hybrid disc which also includes the 3D movie, Tekken: Blood Vengeance, and a demo version of Tekken Tag Tournament 2.